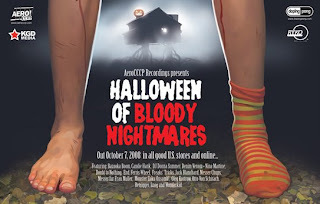 This compilation of darkwave, EBM, and synthpop stylings features covers and original songs inspired by – you guessed it – Halloween. While some veer into cheesy kitsch territory, a few tracks are actually quite listenable, particularly “Social Disease,” by my favorite socially conscious Australian EBM act, Snog, as well as Denim Venom and Nina Martine’s dark and danceable electro cover of the Misfits’ classic paean to a date with death. “Die, Die My Darling” is called “Do Do Min Kjaere” here, and it's pretty good saccharine fun.